WASHINGTON (CNN) -- There's an air of mystery hanging over President Obama's war council, which meets in secrecy yet again this week to discuss a new strategy for Afghanistan in the highly secure White House Situation Room. 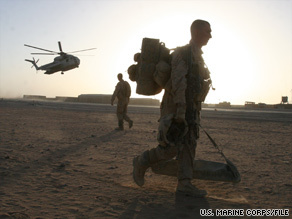 Troops prepare to board helicopters at Forward Operating Base Dwyer, Afghanistan. But senior officials closely involved in the decision-making process reveal that the president and his team are grappling with one particularly urgent question: Will Gen. Stanley McChrystal's push for 40,000 more U.S. troops really secure Afghanistan? McChrystal, who has been joining the president's war council by secure videophone, framed this debate weeks ago by writing in his now-famous memo that failing to send that many troops could result in the mission failing. But some of Obama's other top advisers are privately expressing heavy skepticism that sending 40,000 troops will result in a successful Iraq-style surge. "Afghanistan is not Iraq," one senior administration official said. "To say that we can take what we did in Iraq and Xerox it and send it to Afghanistan is obtuse." A second administration official confirmed this viewpoint has real currency inside Obama's war council. "With 40,000 more troops, you cannot do an Iraq-style surge," this official said. "It's totally different than Iraq. The strategy is not easily transferable -- there are unique challenges in Afghanistan." These officials stressed that the president still has not made up his mind about troop levels, which will be a primary topic of discussion at this week's sixth meeting, and they said it is still possible that Obama will follow McChrystal's advice. But the senior officials seem intent on puncturing the notion that McChrystal's proposal would be a panacea if fully implemented. "The expectations need to be more realistic," the second senior administration official said. "We have to be realistic about what's possible." These advisers to the president believe the public perception has become too focused on the idea that sending 40,000 more troops to the battlefield will result in a full counterinsurgency effort, known as "COIN" within the military, a doctrine made famous by Gen. David Petraeus. "The strategy that was developed by Gen. Petraeus in particular, but also with Gen. McChrystal as his strong right arm, did succeed there [in Iraq]," McCain said. "Should we risk going against the advice and counsel of our best and strongest advisers, those we've given the responsibility? But McChrystal's plan aims only to implement a COIN program in problem areas, not across the country. Senior officials said that in order to fully force a COIN strategy of 20 to 25 troops per 1,000 residents in Afghanistan, there would have to be 600,000 U.S., NATO and Afghan troops and police -- which is basically impossible. It would require either a major infusion of U.S. troops that is just not available right now because of a taxed military, or a massive training of new Afghan soldiers that is too ambitious to reach in a short time. Petraeus' field manual suggests that for a counterinsurgency effort to work in a population center, there needs to be a force density ratio of 20 to 25 troops or security personnel for 1,000 residents. At the height of the Iraq surge, according to the senior officials, there were approximately 29 troops for each 1,000 residents. Right now in Afghanistan, there are about 260,000 U.S., NATO and Afghan troops on the ground, or only about 11 troops per 1,000 residents. If Obama accepted McChrystal's request and sent 40,000 U.S. troops in the coming weeks, that would bring the force density rate up to only 12.5 troops for every 1,000 residents. "The notion of a fully resourced COIN strategy is not in the offing," one senior administration official said of the current deliberations. "We're unable to pick up exactly what we did in Iraq. It cannot be moved to Afghanistan." James Danly, managing director at the Institute for the Study of War, acknowledged that sending 40,000 U.S. troops to Afghanistan would not fully cover the type of counterinsurgency effort envisioned by Petraeus on paper. Danly was a U.S. Army officer in Iraq from 2006 to 2008, which was the height of Petraeus' counterinsurgency effort. "You are right that there will be a shortfall," Danly said after being read the numbers that administration officials are using to weigh the strategy shift. But he added that "marginal increases" in troops "can have a dramatic effect" on security if the troops are used properly. "If we were to take our soldiers and apply them wisely, we will be much closer to parity," Danly said, suggesting that a leaner force can work if it is focused on urban centers instead of the most remote areas of Afghanistan. "There are enough forces to do COIN properly." Senior administration officials are skeptical that it will work. They add that even if 40,000 troops could secure Afghanistan in the short term, they're deeply concerned that such gains would not hold in a nation that -- unlike Iraq -- does not have a relatively stable central government. "So who do you hand it off to?" said one senior administration official. "It's like handing it to sand. There is no 'there' there."